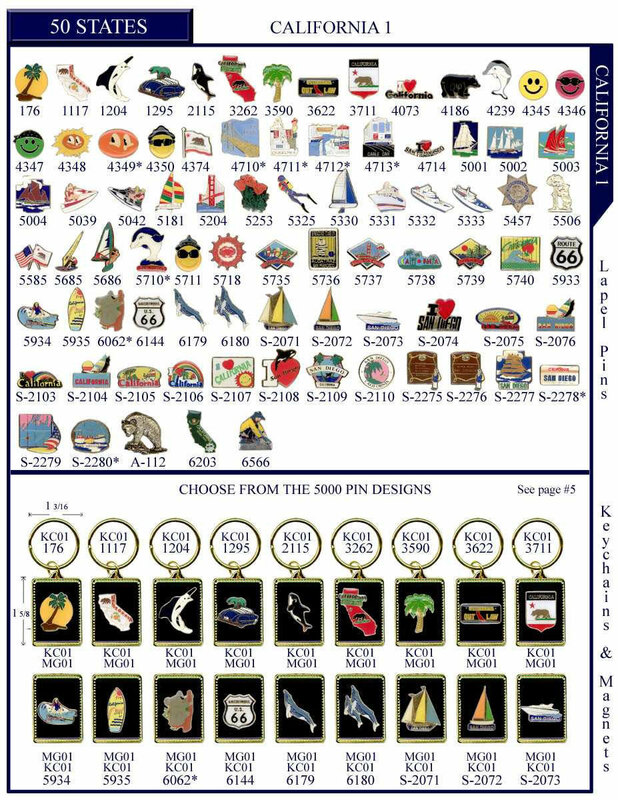 California Stock Lapel Pins - US Ste Stock Lapel Pin -Custom or Stock, Keyholders, Emblematic Jewelry - FACTORY DIRECT TO YOU 3-Day or 5-Day Rush Service Available | Free 10-Day Rush | NO DIE CHARGES Discounts for Government, Organizations, Teams & Corporations Best Prices in the America's for Lapel Pins, Cloisonné Keyholders, Corporate Jewelry & Emblematic Gifts We also manufacture fine crystal or marble paperweights, awards & gifts - call or email for quotations Rush Service Available. Quality California, "The Golden State", and State stock lapel pins. Over 5,000,000 stock lapel pins in stock ready to ship. Major categories to choose from. California State lapel pins in stock. California Designs Keychains and Magnets. We want to be your partner for all your branding needs.. Our product range includes fine full lead crystal awards, trophies, and executive gifts, promotional products, and advertising specialties for small business, major corporations, organizations, and governmental entities. Call us today for your immediate quotation & the recognition program service. Beverlyhillsusa.com is an online catalogue of corporate awards, business gifts, and promotional products. This online catalogue features almost 5,000 of our items for all your branding needs. Website dedicated to fine corporate awards & business gifts. The website has crystal pyramids, stars, obelisks, and trophies from the best cristalleries in the world: Dublin, Edinburgh, Val Saint Lambert, Waterford, and others. The website also has brand names corporate gifts such as A.T. Cross, and Swiss Army. A complete for all your business needs. Website dedicated to advertising specialties and promotional products. Our 'blue' site is an immense online catalogue of items that can be imprinted with your logo or message. You will find all the items you need for your next promotion, company event, trade show, giveaway, grand opening, or any other occasion. Website dedicated to Corporate Programs. We have designed Corporate Programs that finally make it easy to say THANK YOU to your employees for their dedication, loyalty, achievements, exceptional service, and commitment. We would enjoy hearing from you... Contact us today Phone 888-799-2001 Call for assistance with design and personalization. Custom designs are always available. This Website is Copyright of Beverly Hills International, Inc.
All photographs in this website are for reference only. We are unable to supply trademark items without permission of the license trademark holder.